Camden Holmes is a strong, smart, funny little boy living and thriving with PMD. He was born on April 8, 2011, at nearly 30 weeks gestation after his mother fell ill. Despite being born prematurely, Camden even cried at birth and made strong improvements while in NICU. These improvements allowed him to come home from the hospital three weeks earlier than expected. Camden was born with stridor and hypotonia, which was quickly attributed to his prematurity. Once he turned 1 year old and was not hitting major milestones, Camden had a blood test called a chromosomal microarray. This test concluded that Camden had a PLP1 gene duplication. While prematurity could have been a factor in his developmental delay, it was Pelizaeus-Merzbacher Disease hindering typical developmental gains. 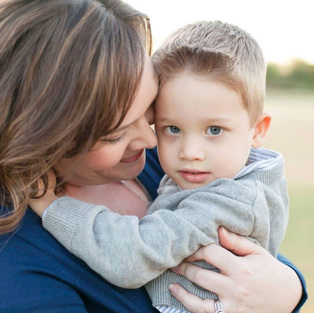 Camden received his PMD diagnosis at 13 months of age. Soon after diagnosis Camden and his family went to the PMD Conference in Indianapolis. It was here that we learned the most valuable information about PMD: that our PMD boys live rich lives. We learned that Camden would grow and improve, and that not everything you read about PMD or leukodystrophy is the reality of living with and caring for someone with PMD. Camden made friends with some wonderful PMD brothers, and Camden's family gained strength during this emotional time. We came home from the conference armed with better information, ready to educate the therapeutic and medical team in how to best care for our Camden. Ever since that summer, Camden has spent a great deal of time in multiple therapies. We find that he best improves in neuro-based therapy like conductive education. Camden is now 4 years old. He lives with his mom and stepdad as well as his dad and stepmom. He has a big brother, Carter, and also 5 step-siblings, all who love and support him. Camden likes to go to preschool and ride the wheelchair lift on the bus. He loves Cheetos and pot pies and likes to get out of work at school by telling jokes on his eye-gaze device. Camden is very smart and knows his colors and shapes. He loves to play with his brothers and loves eating McDonald's fish sandwiches with his Papa. He loves reading books and turning the pages of the book, and his favorite movie is The Lorax. Camden is a loved son, PMD brother, brother to Carter, friend, student, and he is joy personified. His smile and his determination make him a force in this world. His beautiful smile and charming personality make him a lovable boy, but his strength is what makes him a hero.